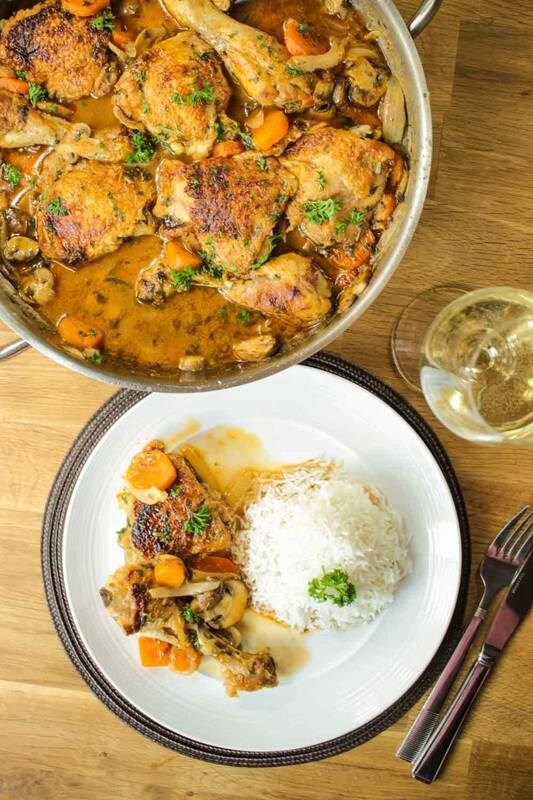 This Chicken Chasseur is an old time classic that's super easy to make and tastes so good - your family is guaranteed to love it! Season the chicken with salt and pepper. Put the oil in to a large pan and on a medium heat brown the chicken until golden brown. Remove the chicken from the pan on to a plate and set aside. You'll now have some chicken fat in your pan, you need about 2 tbsp so if there's too much then drain some off. Add the onion and cook until soft. Then add the mushrooms and garlic paste. Keep stirring until the mushrooms are cooked. Stir in the tomato puree and white wine and cook for about 3-4 minutes until the alcohol has burnt off. Then add the chicken stock. Season with salt and pepper. Return the chicken thighs back to the pan and bring to the simmer. Add the carrots and place the lid on then cook for one hour, allowing the sauce to simmer until the meat is tender. Sprinkle the fresh parsley and tarragon then give it a good stir. Cook for a few more minutes. Serve with rice and enjoy!